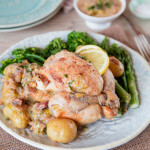 An easy one pot poussin cooked in a rich creamy sauce and served with spring vegetables. Commissioned by Redmond Multicookers. A poussin, or Cornish hen, is the ideal choice for when you want to have chicken but do not have much time, or maybe do not want to have to deal with leftovers. A poussin is a young hen, less than 28 days old, and weighing 14-16oz. Usually a single poussin is a portion, but if you choose a slightly larger one, and cook with lots of other ingredients it is the perfect amount for two. I cooked my poussin in a white wine stock along with shallots, bacon, leeks, and potatoes then served with some freshly steamed green vegetables. A delicious supper can be on the table within 50 minutes of largely hands off cooking time. 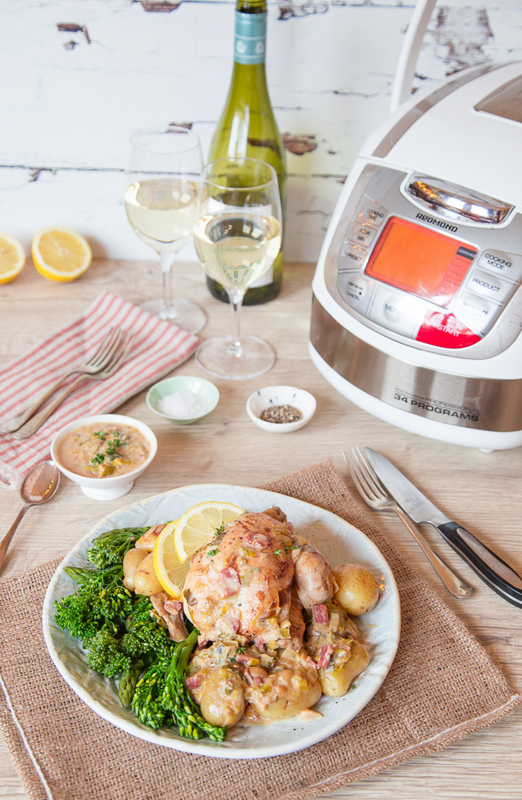 I used my trusty REDMOND Multicooker to make my poussin one pot (first review here). Its 35 functions make it highly adaptable, as well as making coking a breeze. Of course using the multicooker means that your hob and oven are free for making something else, and in hot weather the multicooker is a huge bonus as it gives out less heat than the cooker. Its clever design; all the accessories can be stored inside the cooking pot, and compact size make it ideal for the smaller kitchen, for student rooms, caravans and boats. If you try this One Pot Poussin with Spring Vegetables please tag #FussFreeFlavours on Instagram or Twitter. It is amazing for me when for me when you make one of my recipes and I really do love to see them. You can also share it on my Facebook page. Please pin this recipe to Pinterest too! Thanks for reading Fuss Free Flavours! 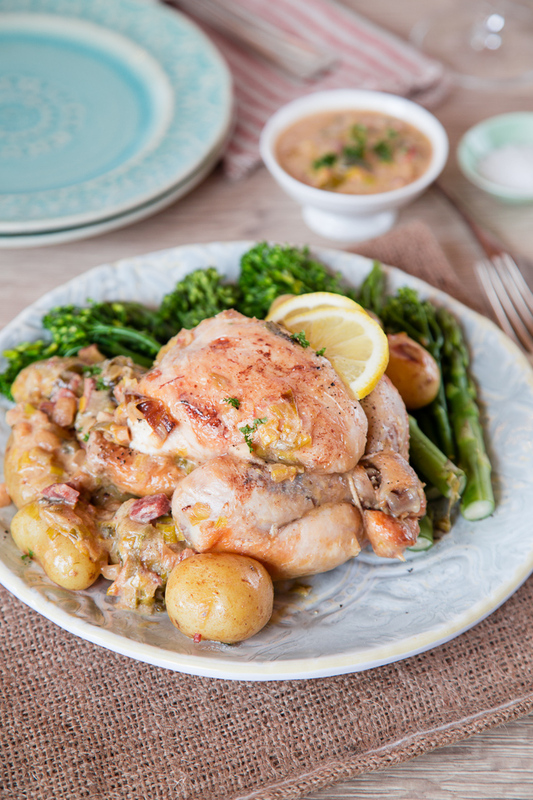 A simple, adaptable one pot meal of a poussin served with a creamy white wine sauce and seasonal vegetables. Spring vegetables such as asparagus or Tenderstem. Set the multicooker to FRY, add the oil and fry the poussin, turning frequently until browned all over. Remove from the pot and set to one side. Add the shallot, garlic, bacon and leek and fry for 5 minutes until soft. Return the poussin to the cooking pot. Season well with pepper and salt. 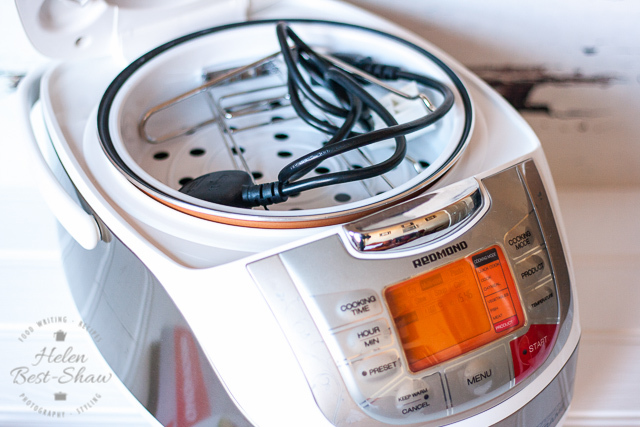 Switch the multicooker to the MULTICOOK function, set the temperature to 120C. Pour over the wine, lemon juice and stock, set the time for 40 minutes and close the lid. After ten minutes add the potatoes, check the amount of liquid after another 15 minutes and add some more stock if needed. minutes before the end of the cooking time, put the green vegetables into the steaming basket and place into the pot to steam. Close the lid and let the cooking cycle finish. Remove the steaming basket, and stir the crème fraiche through the stock. To cook on the hob use a heavy casserole with a tightly fitting lid. Once the ingredients have been fried and the stock added put the lid on the pot and turn the heat right down (you might need to use a diffuser) and gently simmer until the potatoes are cooked. Timings for a small poussin of 14 - 16oz - if using a larger Cornish Hen adjust cooking times accordingly. This recipe would also work with chicken pieces.